These were a limited release to chosen theaters back in the day. This is your chance to own and invest in a GENUINE collectors piece of Rambo memorabilia. ROLLED NOT FOLDED WHICH INCREASES VALUE. I have been collecting for over 37 years. My sibling worked in the Hollywood industry for companies such as Casablanca records, Polygram, Polydor, CBS records as well as worked for CAROLCO with Stallone and Schwarzenegger. She was part of the production team on-site in First Blood Part II and assisted Mario Kassar as well as so many others back in the day. Now with the New Rambo Movie coming out in 2019 these will skyrocket in value and will be definitely worth your investment. 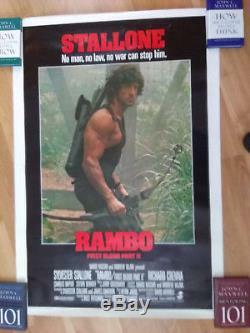 These are one of the most sought after posters in the world for any serious collector and true Rambo Fan!!! Feel free to contact me with any questions and if you want to make a deal with the other posters that I may have let me know. This is 100% authentic an again, an Original issue from the studio CAROLCO PICTURES in 1985 and has been stored for years. It does have slight wear but has never seen a wall or tacks or tape. If you decided to go one step further, you could do a professional vinyl back which actually would take out any of the minor flaws and make it more valuable then it already is. Any questions will responded to ASAP. We guarantee the authenticity of all our products. 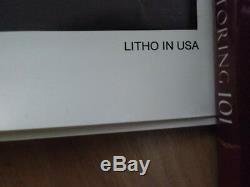 The pictures shown are of the actual item you will receive. 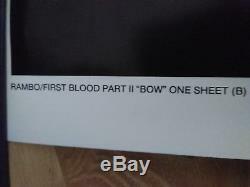 The item "Hoyt Easton Lile Rambo First Blood Part II RARE 1/500 Original Movie 27 x 41" is in sale since Monday, November 27, 2017. This item is in the category "Entertainment Memorabilia\Movie Memorabilia\Posters\Originals-International\1980-89". The seller is "stevicenogl0" and is located in Hillsboro, Oregon. This item can be shipped worldwide.